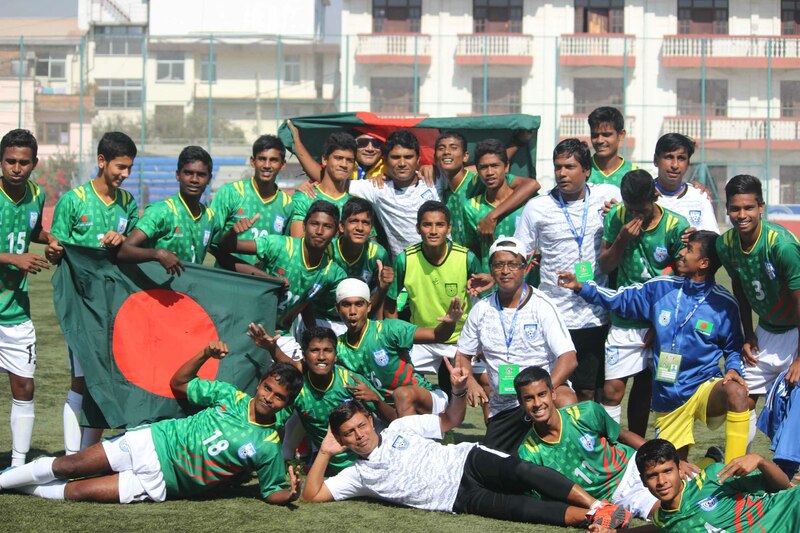 Members of Bangladesh Under-15 Football team celebrating after reaching final of the SAFF Under-15 Championship beating India Under-15 Football team in the tie-breaker of the semi-final in Nepal on Thursday. In the day's crucial first semifinal, Patre Harsh Shailesh put India ahead in the 17th minute by a long distance shot about 35 yards, amid huge celebration of Indian players and their fans (1-0). When the match was almost heading for Indian victory, then tournament's leading scorer Nihad Jaman Ucchash scored the match equalizer in the 3rd minute of the stoppage time from a penalty (1-1) leading the match towards tie breaker. In the penalty shootout, Bangladesh scored four against India's two goals. With the day's goal, Nihad Jaman of Bangladesh further consolidated his position in the scorer list making five goals.